Baybreak is a comfy, light and airy, 3 bedroom cottage, with higher end appointments and features, located just a few minutes walk from the beach & white sands of Vincentia, on Jervis Bay (not far from Hyam's Beach). It has lots of character, polished timber floors, beach house feel, large outdoor deck for alfresco dining & plenty of glass which captures the natural surroundings. Set among the trees in our garden and screened from neighbouring properties, the house is very private and the only thing to disturb you will be the sounds of birds during the day and at night the gentle washing of waves on the sands of nearby beaches. This airconditioned house is designed and furnished for relaxed living; the upper level consists of living-room, main bedroom (Q/S bed with ensuite) and a separate studio / sun room which offers a quiet refuge from the rest of the house. All 3 of these rooms open onto the elevated, private deck with an outlook through the trees in our garden. There are 2 other bedrooms located on the lower level of the cottage (one has a Q/B, the other 2 x singles), with their own modern bathroom. The modern, fully equipped kitchen and dining room are located on the mezzanine level. Mod cons include large screen LCD TV, DVD, Hi-fi + Ipod dock, BBQ, dishwasher, ceramic cooktop, microwave oven, Nespresso coffee machine & washing machine. We provide a selection of CDs, DVD movies, games & holiday readings for the enjoyment of our guests after a busy days recreation in and around the waters & bushland of one of the worlds most beautiful marine park reserves. The house is set back from the road in a bushland garden setting, behind a stand of gums. Its a short stroll to beach, boat ramp, shops and restaurants. It will especially suite those looking for a relaxing break, close to the Bay's wonderful ocean playground and appreciated by guests looking for quality furnishings with those little added touches to make your stay all that more special. The cottage has reverse cycle air-conditioning for comfort in all climates. The abundance of trees on the property are home to families of Rosellas, Lorikeets, Kookaburras and Possums and can provide a truly magnificent spectacle, especially at feeding time. Vincentia is one of a cluster of villages on beautiful Jervis Bay, Australia's premier ocean marine park, just 2.5 hrs easy drive south of Sydney. The beaches surrounding the area are renowned for having the whitest sands in the world. The calm, crystal blue/green waters of the Bay are perfect for swimming, snorkelling, diving, boating, kayaking, fishing, dolphin watching & in WINTER there is whale watching. Off the water there is golf, bushwalking, dining & much more, all within a short distance from the house. The Bay & Basin Leisure Centre, an easy walk or 2 minute drive from the house, has an indoor water slide and pool for the kids or gym, lap pool and fitness classes for the adults. Visit the spectacularly beautiful Booderee National Park, Jervis Bay, MAJOR GOLD AWARD winner, NSW Tourism Awards. Our guests can enjoy a whale and dolphin cruise on heritage listed Jervis Bay, courtesy of DOLPHIN WATCH CRUISES - please ask for voucher on booking which will entitle your party to a 20% discount. To ensure the comfort of our guests, we accept bookings of a maximum 6 persons. WE DO NOT ACCEPT BOOKINGS FOR "SCHOOLIES" BREAKS and under no circumstances do we let the house for "party" weekends. NB: Our rates are based on 2 persons staying double share and we charge a modest extra fee for extra persons, both adult and child (up to a max of 6 persons), or where a party of 2 require use of 2 separate bedrooms. In this way we can set low economical rates for small parties such as couples and larger groups are charged slightly extra based on the number staying. # 7 nights Christmas/New Year holiday period. We accept bookings only from persons who have verified their identities with Homeaway/Stayz. # There are internal and external stairs which may be a problem for toddlers. Where children are included, we recommend they be steady and sure on their feet and competent on stairs. Phil is a retired management analyst and Loretta sometimes works casually as a re-location manager. We have 4 grown-up sons and we love spending time with family, grandchildren and being active. We are happy to share our holiday homes in spectacular Jervis Bay and Kangaroo Valley with fellow travellers. We have done house exchanges in the UK, US and Europe and love the different twist this puts on travelling and meeting people. This has been our family holiday home for more than 35 years. All our kids spent many hours at the local beaches and waterways when they were growing up and now its being used by our grand kids. We love to be able to share this happy home with our guests from time to time. Baybreak is located a few minutes walk to beach, shops and restaurants. Optional bath towel service available or save this cost by bringing your own. Beautiful home for a family stay! We had a great stay at this beautiful home. Extremely clean, equipped to cook nearly any dinner desired(!) and good location. Even had a baby play mat for the little one. Thanks so much!! Great house, clean and tidy as well as close to everything. Very clean and well appointed home. We had a really nice 5 day stay in Jervis Bay, made all the easier and nicer by staying at Baybreak. Every room was spotless and the entire house is very well appointed. The bathrooms were a particular standout as they have been completely modernised. We thoroughly enjoyed watching the parrots in the trees while enjoying breakfast on the balcony. The street itself is very quiet with plenty of natural surrounds. We would definitely recommend Baybreak to anyone looking for a holiday home in the area, it will exceed expectations. 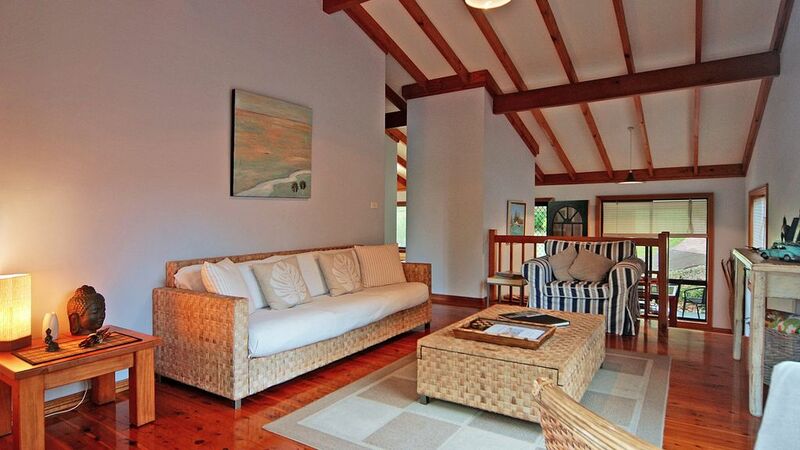 The house is in a great location - close to the National Park, shops and main beaches. The kitchen is well stocked and house has everything you need. A pleasant stay at Vincentia. Everything we required was in the house. Very pleased with the abundance of crockery, glassware etc. This enabled us to clear up quickly after each meal and use the dishwasher. So many places we’ve stayed at before only have crockery and kitchen items to cater for a minimum of guests and needing to wash up after every meal. Also pleased with essential items such as dishwasher tablets, kitchen wrap and kitchen paper all on hand. Bathroom facilities were excellent with new fit outs and toiletries to use if required. Very pleased to see a great selection of DVDs which we used every night. A pleasing selection of magazines to read. Enjoyed the Coastal one. The air conditioning was very welcome as we had some very hot and humid days while we were there. We were interested in looking at the family photos and appreciate the years of effort that has gone into building and improving your holiday house over a number of years. Nightly visits from possums was a little alarming to begin with but once we realised what was making all the noise we were ok. We did not feed or encourage them. Perhaps the only negative of our stay was the presence of ants and cockroaches in the kitchen. There was evidence of them upon opening the door for the first time so we were pleased to see some spray in the cupboard for us to use. At no time did we leave any food items on the kitchen benches. We also had to kill a couple of large huntsman spiders in the lounge room. A complete pest treatment would be beneficial for the home. This should not be reviewed as a criticism, but rather feedback for your attention. Thankyou for renting your family holiday house to us. We had a lovely stay at Vincentia and may well return another time. Thank you so much for all the lovely comments about our holiday home and your detailed review. We are so glad you enjoyed your stay and found the house most comfortable, so a little disappointed with just a 3 star rating, but alas we are grateful for your feedback and will make sure we do better next time. As for the bugs we do get from time to time, as do most regional holiday properties, it is very difficult to ensure complete eradication 100% of the time, despite regular pest treatments, but very happy you found the bug sprays we leave, just in case they are needed.